Train travel in the USA is not dead. Despite the fact that the United States may be the land of the car, nothing can compare to seeing the country from aboard a passenger train. 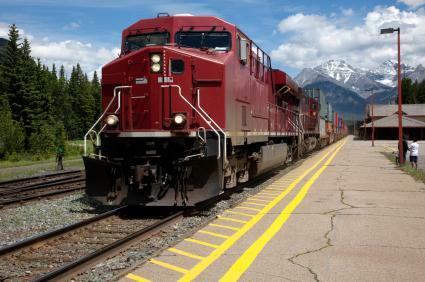 From private operators with exclusive packages to the U.S.-owned Amtrak, tourists and travelers enjoy a rare experience when traveling the nation via rail. Thoughts of rail travel transport travelers back to the 1800s when the industrializing East struggled to connect the Atlantic and Pacific oceans with rail roads criss-crossing the United States. Train travel in the USA generally means traveling by Amtrak. The company is subsidized by the U.S. government and offers more than 30 different lines connecting most of the major cities in the U.S. Train travel is not always direct, but it's remains one of the more comfortable ways to travel the countryside with fewer luggage fees, the ability to get up and walk around and work. The rise in gasoline prices coupled with the airlines' increasing charges for luggage has increased Amtrak's passengers since 2001. Intercity trains traveling up and down the Eastern seaboard make travel from Boston to New York to Washington, D.C. an affordable option for business travelers needing to commute and back forth. Residents of Vermont, New Hampshire, Pennsylvania and New Jersey can also travel into New York City proper via commuter trains. Beyond the Eastern seaboard and Chicago regions, Amtrak travel is less reliable, but no less inviting. Travelers enjoy the social atmosphere on the trains as well, as the reduced environmental impact and scenic routes. Like airlines, U.S. rail travel offers different levels of accommodations from first class to business class to coach. But even passenger train coach class includes larger, more comfortable seats than those found on a typical commercial airliner. Passengers traveling with younger children will enjoy the wider accommodations and the freedom to move about the train. Dining cars and lounge cars on longer passenger lines also add to the degree of comfort. In addition to socializing and sightseeing, passengers can enjoy meals and refreshments. With so many options available, pricing makes rail travel very affordable. As with any form of travel, the weather can delay your travel plans, so be aware that heavy snows and rains may cause delays in your departure and arrival times. Train travel in the USA is at its peak from April to September. Costs of tickets rise to meet demand. Spring and autumn may be the best time for ticket pricing, but you could face the possibility of delays due to weather conditions and less daylight for travel viewing. Rail operators maintain websites with timetables and routes as well as onboard amenities. Amtrak, for example, maintains the Amtrak System Timetable, which details the routes and timetables for all Amtrak trains and bus connectors. These are good resources to consult during your trip planning and in the days leading up to your departure. Also, if you are planning a trip around a national holiday, be sure to book your tickets early to be sure of a good seat. Frequent rail travelers should consider purchasing a rail pass. Amtrak offers different levels of rail passes broken down by U.S. zones. Compare the cost of individual tickets for your trips versus the rail pass to be certain of its economical value. However, generally, the more you travel, the more likely you are to benefit from it.